Border visibility, color, pen style and width. The Corners property lets you square or round each corner individually. The degree of rounding can be tailored. FillStyle controls the fill color and type (solid, hatched, image, gradient). ImageQuality and TextQuality properties can also be fine tuned. SeriesOrientation is an enumeration that orients the entire PlotArea either Vertical or Horizontal. XAxis, YAxis, and YAxis2 properties. These axis properties control the scale and appearance of both axes. See the Axes topic for more information. DataTable: Displays a spreadsheet style table of the data in the chart, typically just below the chart itself. See the DataTable topic for more information. 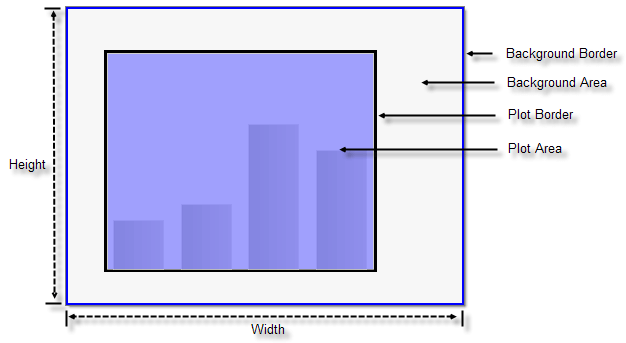 EmptySeriesMessage: The predefined message that displays in the PlotArea when there is no series data defined for the chart. MarkedZones: Areas in the background of the chart that can be defined, labeled and filled. MarkedZones are used to highlight or group areas on the chart. The Dimensions property provides control of Width, Height, Margins, Paddings and if you want the dimensions to Autosize. SeriesPalette is a property of the chart that lets you to choose a predefined skin color palette for each series.This can help provide a distinct look to differentiate each series. The Shadow property lets you control shadow Blur, shadow Color, shadow Distance and Position relative to the plot area.